If the District does not use emergency closing days between now and April 17, school will be closed on Thursday, April 18. 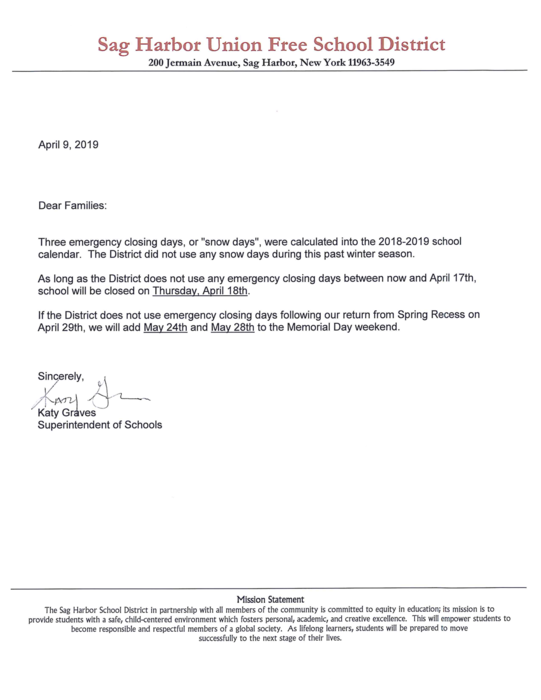 If the District does not use emergency days after our return from Spring Recess on April 29, we will add May 24 and May 28 to the Memorial Day weekend. The Key Communicators' Meeting scheduled for Wednesday, April 10 is rescheduled to Wednesday, May 8. 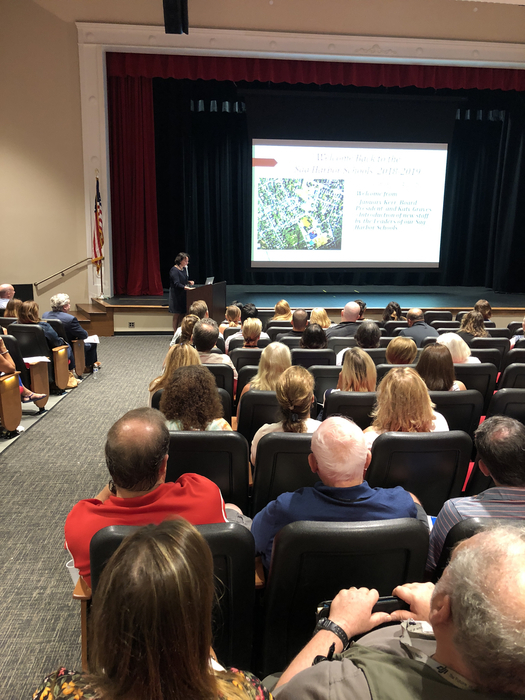 The School Budget Vote and Election is May 21, 2019. There will be 3 open seats. To be on the ballot you must have a completed nominating petition to the District Clerk by April 22, 2019 by 5:00 PM. Pick up petitions at the District Clerk's office or from district's website. The Lead Teacher Presentation that was scheduled during tonight's Board of Education meeting has been postponed. March 4, 2019 - 2 Hour Delayed Opening. Morning Pre-K and morning SHAEP are cancelled. Come cheer on Pierson's Girls Basketball vs Mt. Sinai TODAY, Friday February 22nd, at Walt Whitman High School in Huntington Station at 4:30 PM!! Tuesday, February 12, 2019 All after school and evening activities are canceled.​​​​​​​ Winter bus stops are in effect. Channel 12 News will highlight Lady Whaler's Basketball game and undefeated season tonight at 10:50 PM. Congratulations to the Whaler's and good luck in the playoffs, Lets Go Whalers!! Don't miss the Opening Night tonight of the Middle School Production of Willy Wonka and The Chocolate Factory!! 7:00 PM! Don't forget: Tonight is Coaches vs Cancer Night First Responder vs staff 5:40 pm Pierson varsity girls basketball vs Babylon 6:30 pm Donations accepted at the door. Proceeds will go to the American Cancer Society and St. Baldricks Foundation. January 25th - Spirit Night January 29th - Coaches vs. Cancer, First Responders February 1st - Varsity Boys Basketball vs. Bridgehampton February 6th - Varsity Boys Basketball Senior Night February 7th - Varsity Girls Basketball Senior Night - for the League Championship! Congratulations to The Varsity Boys Swimming Team for the undefeated League Championship they earned with a 9-0 record. Good Luck in the playoffs! Brian DeSesa was appointed to the vacant board seat at last night's meeting and will be sworn in on January 28th. There will be 3 board seats open at this year's election on May 21st. Petitions to be on the ballot must be submitted by April 22, 2019 to the District Clerk. The Special Board of Education Meeting scheduled for tonight, January 15, 2019 has been cancelled. The Board of Education would like to thank Brian DeSesa, Caleb Kercheval, and Yorgos Tsibiridis for their willingness to serve, and applying for the open seat. We look forward to getting to know them a little better during interviews on January 14, 2019, 6pm Pierson library. 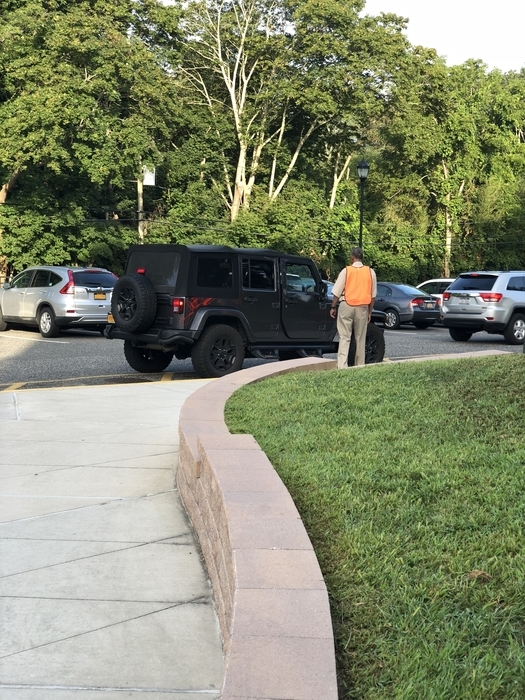 Just a reminder there will be an early release drill today. Pierson will be dismissed at 1:31 pm and Sag Harbor Elementary will be dismissed at 2:36 pm. 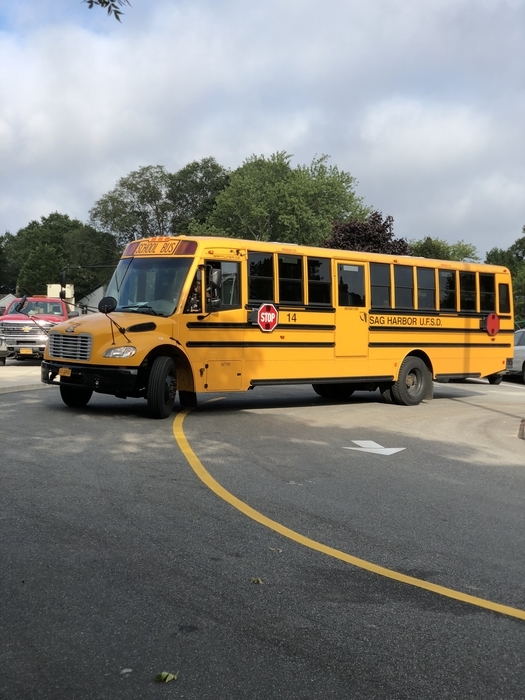 There will be no shuttle bus to East Hampton sports on Friday, December 21 due to the Early Release Drill. The Board of Education Meeting scheduled for Monday, December 10 is cancelled. 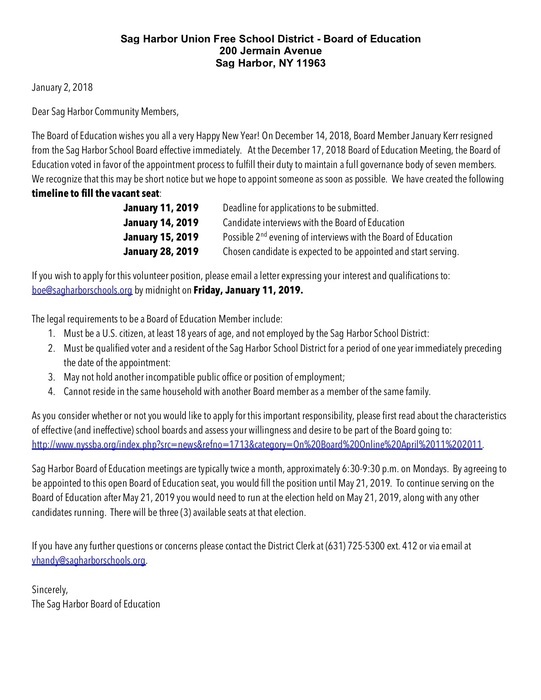 The Board of Education Business Meeting which was originally scheduled for December 3 is rescheduled to Monday, December 10 at 6:30 PM in the Pierson Library. The Board of Education Meeting scheduled for Monday, December 3 is cancelled. Board of Education Special Meeting Tuesday, November 13, 2018 Pierson Library 6:30 PM Agenda available on BoardDocs as of Monday, November 12, 2018. Come to the Rube Goldberg Fair today from 6:00 PM until 7:30 PM in the Pierson Middle School Gym and see the innovative Rube Goldberg Machines that have been created by students over the past two months. 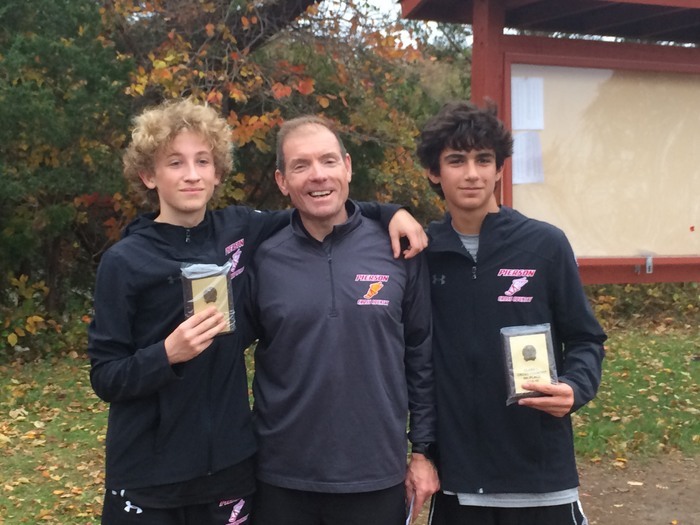 Congratulations to Ben, Peter, and Penelope for qualifying for the NYSPHAA State championships. 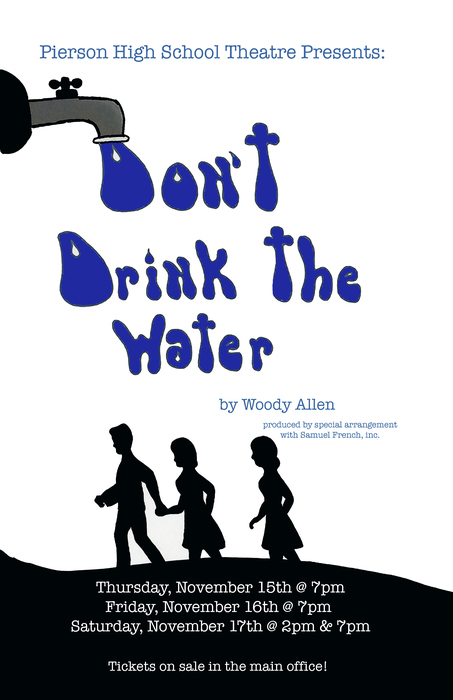 Come out and support them on November 10 at Sunken Meadow State Park. Girls class C race begins at 10:30 a.m. Boys class C race begins at 12:30 p.m. Let's Go Whalers!!! Congratulations to Henry Brooks for qualifying for the state championship in golf this spring. This is a first time for a Pierson athlete. Way to go Henry!! Sadly the girls volleyball season has come to an end with a very close match to Mattituck in the sectional championship game at Shorem-Wading River . Great season for the girls , let’s Go Whalers!! Girls Volleyball down 6-1. Ladies don’t lose your drive we are cheering you on. Go whalers! Sadly, the Field Hockey team falls to Carle Place 7-0. Great season girls! Halftime at the Long Island Field Hockey Championships. Pierson is down 6-0 to Carle Place. Don’t lose steam girls we believe in you! Go whalers! Today's Middle School Boys Soccer game has been cancelled. The boys will meet the coaches in the cafeteria at 3:00 today for an end of season meeting and to return uniforms. There is still time to be heard. 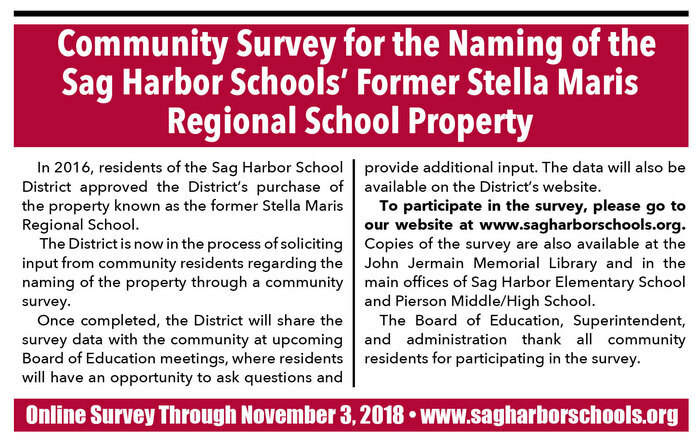 If you have not already done so, please complete our online survey for naming the former Stella Maris Facility at https://www.surveymonkey.com/r/StellaMarisNaming. The survey ends on November 3. Come and cheer for the Sag Harbor Volleyball team Saturday, October 20, 2018, at the 4th Annual Pierson Volleyball Tournament! The tournament starts at 9:00AM. October is Domestic Violence Awareness Month. Thursday, October 18, 2018 is "National Wear Purple Day" to help bring attention to this issue. 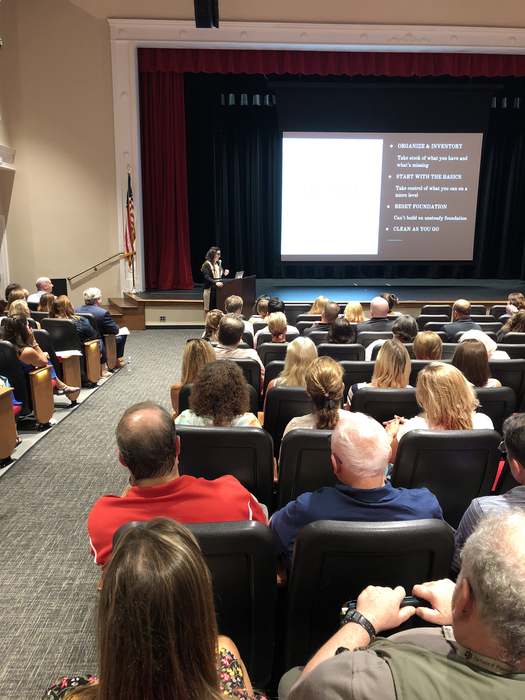 "High in Plain Sight: A Substance Abuse Prevention Training" will be presented for parents/guardians on Tues., October 9 from 6:30-8:00pm in Pierson's Auditorium. REMINDER: Officer Galloway asks that students and children not attend, as that would limit what can be discussed. Board of Education Educational Meeting Monday, October 1, 2018 6:15 PM Pierson LIbrary There is a proposed executive session at the beginning of the meeting with the regular session immediately following and a proposed executive session following the regular session. 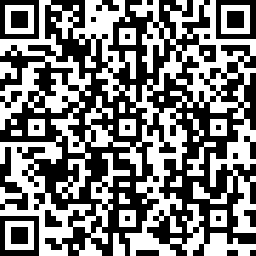 The meeting agenda can be viewed online at: http://bit.ly/SHUFSD_BoardDocs. The latest edition of "Counseling Office & College News" is now available online at: http://bit.ly/2PSWki2. Assemblyman Fred Thiele will speak at the Board of Education Meeting on Monday, September 17, 2018. 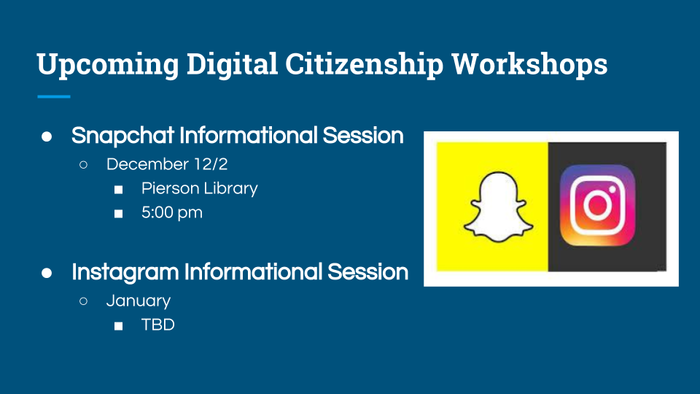 The meeting will be at 6:30 PM in the Pierson Library. Mr. Thiele will share information on the East End Commuter Trains. The community is encouraged to attend this meeting. Due to the high heat and humidity there will be a FULL HEAT ALERT today, September 6th. No practices, scrimmages or contests are permitted for the remainder of the day. Check with your coaches for schedules and meetings. Due to today's heat, the sports meeting for 7th and 8th grade parents, players and coaches is moved to the Auditorium at 5:00 pm. Attendance is mandatory. There is no middle school football practice today, please plan to attend this informational meeting. Due to the high heat and humidity there will be a FULL HEAT ALERT today, September 4th. No practices, scrimmages or contests are permitted for the remainder of the day. Check with your coaches for schedules and meetings. 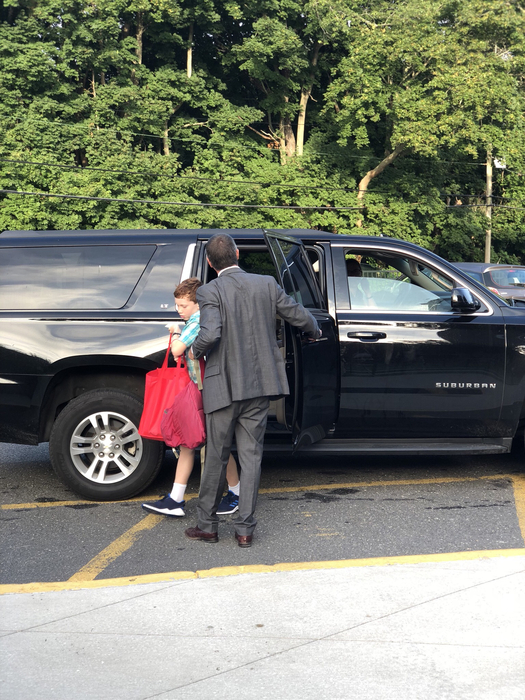 The 2018-2019 Welcome Back Letter from the Superintendent can now be found online at: http://5il.co/4o89.